When Freddie Burns kicked Bath into an early second-half lead, it looked as if Exeter were at risk of letting their 100% record slip. They weren’t. It took the Chiefs only nine second-half minutes to score three tries, putting the result beyond doubt. Last season’s losing finalists looked worryingly short of physicality in the first half, and it’ll take them a few weeks to adapt to the long-term losses of key forwards Jonny Hill and Matt Kvesic. Next weekend’s European clash against Toulouse looks to be a sparkling encounter. Bath’s early season form has been tumultuous, and Rhys Priestland admitted that there will have to be some “awkward conversations” if Todd Blackadder’s men are to fulfil the potential that their team sheet threatens. For an in-depth report on Exeter’s victory at the Rec, follow this link. With former England defence coach Paul Gustard now at the helm, it’s no surprise that Harlequins are looking very difficult to break down for opposition teams. Only Exeter have conceded fewer tries than Quins, who came close to toppling Saracens at the Stoop last night. Saracens’ intensity in attack was startling, especially in the closing stages, but Owen Farrell will have been disappointed with how he struggled to control the game when his forward pack were dominating. Having had the worst defence in the league in the opening four rounds, Leicester have improved dramatically in the past two games, conceding only two tries in each. Former player Brett Deacon is now Tigers’ defence coach, and should take credit for this upturn. 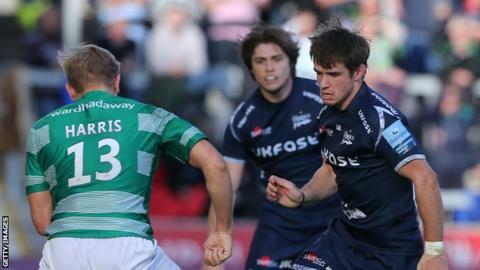 Jonah Holmes looked particularly impressive in difficult conditions for Tigers, and if the former Yorkshire Carnegie flyer can build on yesterday’s display he could well force the ageing Adam Thompstone out of the starting team. Northampton looked valiant, but they are devastatingly inconsistent and Chris Boyd will have his work cut out to implement his well-versed coaching methods over the coming weeks. Thankfully for Saints they can take a break from top-level action, though the visit of Clermont Auvergne in the Challenge Cup next week looks tasty. How deep is the Falcons’ hole? It’s very rare for a team to go from the top four one season to being adrift at the bottom the next, and Dean Richards has his work cut out as Newcastle looked awful in defeat at Sale. Worryingly for the Falcons, Richards has made his money by assembling teams effectively – not coaching them – and they’ll be relying on Head Coach Dave Walder to improve their results with the threat of European top-tier rugby next week. Sale have also looked poor in the opening rounds, but yesterday’s result was a welcome reminder of the Sharks’ quality for the rest of the Premiership, though it looks as if Marland Yarde will be missing for the majority of the season with a dislocated knee. 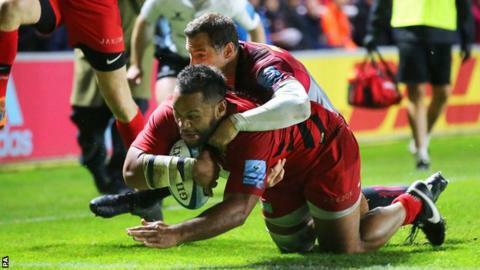 Having lost twice in the past two weeks, Gloucester’s visit to Coventry was looking vital in arresting a slump that has tarnished the Cherry and Whites’ top four hopes. With the help of former Wasps favourite Danny Cipriani, Gloucester ran riot, looking sumptuous in attack. It’ll be interesting to see how Johan Ackermann’s side cope with Heineken Champions Cup rugby – Castres travel to Kingsholm next week before Gloucester visit Munster. Wasps’ unpredictability is their biggest downfall, and there’s now a 10 point gap between them and the two league leaders. Any Premiership winning side needs to win their home games, and Dai Young admitted that the result was disappointing.